Disney After Hours at the Magic Kingdom. Is it worth it? 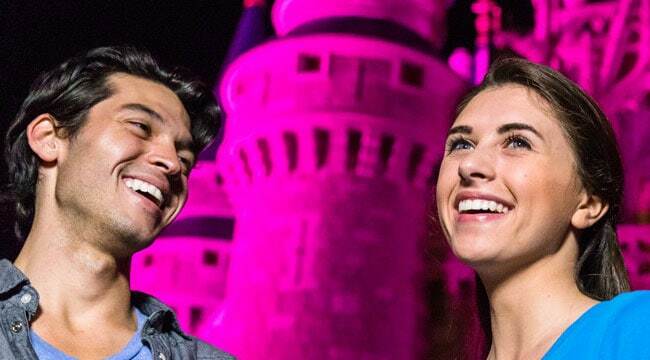 Disney After Hours is a hard-ticket event that is hosted at the Magic Kingdom on select dates in February and March. It allows you to ride most rides with little or no waiting, and enjoy complimentary Ice Cream Bars, Popcorn, Bottled Sodas and Water for up to 5 hours. Is it worth it? Before we begin, don’t confuse Extra Magic Hours with Disney After Hours. Extra Magic Hours are a benefit to every guest staying in an official Disney World Resort at no additional cost. Disney After Hours is a special hard-ticket party that is available only to those who pay the additional cost. Any guest may purchase a Disney After Hours ticket. When you attend the Disney After Hours party, you’ll be allowed to enter the park at 7pm and stay for 3 hours after park closing. You’ll enjoy an empty park with special treats and great empty park photos. Photopass photographers are stationed in various locations within the park for special Magic Shot and Castle photos. I’ll confirm the locations in January. If you want empty park castle photos, just wait until later in the party and you’ll likely get photos with NO ONE in them. This special event is mostly about rides with no waiting, especially during the last couple hours of the party. It does not offer any type of special parade or fireworks. I think it would sell much better if they offered a special parade or fireworks. Official check-in for the event will take place at the Main Entrance to Magic Kingdom park beginning at 7:00 PM. Event begins at park closing time and continues for 3 hours. Tickets cost $119 for adults and children. There is a discounted price of $89 available for Annual Passholders and Disney Vacation Club members. Tickets can be purchased online or by calling 407-827-7185. Arrive at Magic Kingdom by 6:30pm, if you aren’t also using a day ticket. I’ll check on in-park locations in January. Use a Fastpass or two. Enjoy the rides by following my Disney After Hours plan on Character Locator. It will help you enjoy your full-time in the park with no waits. Well, that’s a bit of a judgment call. If you’d like to feel like you have the park to yourself and do a bunch of rides in the Magic Kingdom with little or no waiting while gorging on high carb snacks, then the party can be worth it for you. If you are planning on spending a couple of days in the Magic Kingdom during your trip, there may not be much value in visiting this hard ticket party. What do you say? Is it worth it to you? Where are the Magic Shot locations? Thanks I found them. I din’t think to look under the EXTRA tab initially. Thanks for that. I’m a new Character Locator subscriber, looking forward to using it to improve my photos in my upcoming trip next week. Thanks for all the help, and especially all the maps. I was so frustrated at MNSSHP last year trying to find characters on Disney’s useless map. It is mentioned that you can enjoy up to 5 hours of water, soda, etc. if you arrive at 7pm can you start taking advantage of this or is it only between the hours that the park is opened for those 3 hours? My older three teenage girls 19, 17, and 15 and I are doing this the very last night before we come home the next day from our weeklong trip. We are looking forward to the “no line” rides and the photo opportunities. So tempting! After attending the Halloween party and seeing that party at capacity, it still was possible to enjoy many rides easier than a regular park day, this seems like a must-do to max our time. I heard it gets pretty cold at night in January though. Should I change up my days to do Universal on Monday the 28th and follow up with the DAH? The dates you have listed are for 2018. Do you know what the dates are for 2019? They are now available on the Disney app. I noticed on my trip that 1/24 and 1/28 are available. Hi! Thanks so much for this great information! I’ve read some articles that say Splash Mountain isn’t open during the event and some articles that say it is open. Does anyone know for sure? Splash is our favorite ride and I don’t want to pay for the tickets unless it’ll be open during the event. Thanks again! Splash was closed for a refurbishment for quite a while, so that may be why some said it was not available. We attended After Hours in Feb 2018, shortly after refurbishments to Splash were completed. Splash was open for After Hours that night. Can you get in at 7pm for the 900 pm after hours? Hello i’m considering to buy this tickets. I have a young son and a 1 year baby, we are used to sleeping late. The event is from 10pm to 1 am. June 28th. I went many times to the park and only want that my son ride the attractions. I was a bit concerned by the hot weather for my baby and long queues, and i found this event. Will i be able to enter into the park at 7pm until 1am, those would be 6 hours!! !, almost the same time that i planned to stay with a regular ticket, i think it worth it, what do you think??? It was TOTALLY worth the $. You’ll never see such short lines during the day for Splash, Big Thunder, Space Mtn., Astro Orbiter, Mine Train, Peter Pan, or Haunted Mansion. We rode all of those during After Hours. (We rode several of them more than once.) We saw the fireworks while riding Mine Train! I also had the best experience on Small World: I was the only person on my boat. Nobody was on the boats behind me or in front of me. It felt like I had the ride all to myself. Pure joy. Do I need a regular pass to get in at 7:00 or just the After Dark pass? And if I have both, do I clear the park at closing to go back in? Do it! The first time my husband and I went to the Christmas Party was the first time we really enjoyed the Magic Kingdom. We can’t wait to do the After Hours next week after reading this page! Any chance they will release more dates for April? What characters are there for this event? Can passholders buy a discounted ticket for a non-passholder who will be with them? Thanks for the quick reply! Much appreciated. Thanks for the post. It’s hard to get info on DAH. We’re planning a long day at MK on 2/8/18. Day ticket 9a-8p; hard ticket 8p-11p. We were wondering about when to get the credentials. Ideally, it would be great to have them with us so when the event starts, we can just put on our lanyards and keep moving, rather then going back up front and getting in line. Do they ever give out credentials earlier in the day? Or better yet, earlier in the week? This sounds like it could be a lot of fun. How does the crowd compare to other hard ticket events like Halloween and Christmas parties? We enjoyed Disney After Hours last year and it was easily our best experience at the Magic Kingdom. We arrived at 6:30 and enjoyed the fireworks and then as many rides as possible. Some rides we even rode twice without having to line back up. Splash Mountain just left us in the same log for 3 consecutive rides!!! We ate all the ice cream and popcorn we can handle and will treasure our experience for years to come. The only downfall is that returning on a regular day is now somewhat painful and unproductive. Our kids were 6,9 and 16 at the time. That’s amazing!! I just bought the tickets and you give me all informations I’m asking for. Thank you so much!! I am doing this in January for a 3-day Anniversary trip. On the day of the After Hours Event we are heading to Universal for Harry Potter. Because the parks close early in the winter, I see this as a great event for a short trip. Having just returned to Ohio after 13 days at the parks with our 2- and 4-year-olds, the idea of getting a babysitter and having our first date night in forever, just the TWO of us running around Magic Kingdom like we used to when we were young sounds like a dream come true! And as Annual Passholders, the discount is awesome. Contemplating a return trip in January/February and definitely considering this. What if we did a non-park-hopper stay, used this as a “one night PH” and did a 7pm ADR, do you think we’d get in in time to get to a 7pm ADR w/o an actual MK valid day ticket? It would have to work out just right to make it worth it, but I have 3 kids and really, if I can get my then-16-y/o to babysit the younger for a night (since all 5 of us can’t run my full-day schedule AND really make an extra $400 in PH tix worth it w/o many tears at the end of a 7-day trip…can’t do it EMH to EMH every day! ), that would-be $400 in PH money would be much cheaper as a me & hubby dinner & date night! Hmmmm…. Once you enter the park at 7pm with this ticket, you may go wherever you wish in the park, including dining. We did it in February with 5 teenagers. It was so fun! The kids had a blast running around together; I have the best pictures from their 5 rides on space mountain. My husband and I loved it as well. Empty streets, no lines, gorgeous pictures, yummy snacks. My fear is, this will eventually go the way of the regular parties–oversold and overcrowded. I feel like now it’s still a special secret but will eventually get “discovered.” And then won’t be as fun. If I were younger this would be ideal & I’d love it. But for seniors, not so much. Way too much running around to get on all the rides, plus my favorite, Pirates of the C. isn’t even open. As for a parade? In all the yrs we’ve been going we’ve only sat through one parade, The Main St. Electrical Parade so if it’s rides you want you won’t waste your time on a parade. We did it last year and loved it! It’s the one time our kids have been able to ride EVERYTHING without a wait as many times in a row as they please. I’m sorry, I’m a Disney Fan but I have better ways of spending my money these days. No apology necessary. Everyone is free to express their opinion here. I can see this being the perfect event for a business traveller in the Orlando area who wants to visit Disney or someone who only wants to visit the mk for one day and no other park. You can accomplish pretty much everything you want in a short amount of time. To me it isn’t worth it as an annual pass holder. Maybe if I was visiting from out of state the extra cost may be worth it. However, if they were to offer special character meet and greets that are rare or special I would consider purchasing this ticket. I do go to the Halloween and Christmas parties at MK and feel those are for sure worth the money! Kenny, is that 9:00 closing time for March 8 solid? Disney still lists MK closing at 8 so wasn’t sure if you had better info. We get there that day and I’m considering doing this event. Thanks! If you were going to buy a one or two day ticket anyway this might be ok. If they offered it during crazy busy season it’d be a no brainer. Do you have to have general park admission in addition to the party hard ticket or will the party hard ticket alone suffice? Thanks in advance, Kenny, for your response and always helpful (and entertaining!) posts! Disney After Hours ticket gets you in at 7pm and you stay for 3 hours after park closing. In order to enjoy Magic Kingdom before 7pm, you’d need a regular day ticket.